Greece is a stunning place to visit and one of the world's top destinations. The climate is perfect for enjoying the extensive coastlines, beautiful stretches of beach, and numerous island clusters dotting the Aegean and Mediterranean Seas, while inland, rugged mountains, olive orchards and wine-growing valleys, timeless villages and lively cities arrest the attention and draw visitors into what life in Southern Europe really is. Generally speaking, Greece is separated into five different regions. The largest region is comprised of much of Greece's central and northern area, taking up roughly two thirds of the country's landmass. Although home to Greece's second largest city Thessaloniki, much of the area sees very little tourism and offer the intrepid traveller vast unexplored horizons, containing such treasures as the site of the oracle of Apollo at Delphi, and Greece's highest mountain, Mount Olympus. The capital city of Athens - itself filled with some of the finest architectural ruins of the Ancient Greek Empire - sits within the region known as Attica. Here too is the first capital of Greece, Aegina, the long stretch of Attic coast, and numerous ferry ports out to the Greek islands. 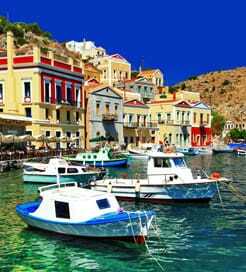 The numerous islands are Greece's biggest draw, offering a wide array of cosmopolitan attractions. Here, visitors will find medieval structures, ancient monuments, fabulous beaches, exciting nightlife, or that unspoiled island tranquillity one pictures when thinking of quiet fishing villages, whitewashed walls and terracotta tile. Crete is Greece's largest island and a destination unto itself. Home to around 650,000 inhabitants, there's a great deal to explore among the island's four prefectures. The southern region of Greece is known as Peloponnese, cut off from the rest of mainland Greece by the Isthmus of Corinth, and home to the oldest cities of Europe, Venetian fortresses, fishing villages, quiet resorts and seaside towns. If you’re travelling to Greece by ferry then the international options comprise of a number of routes sailing across the Adriatic Sea from Italy. Depending on time of year you can travel from the North, East, or South East of Italy to the ports of Patras and Igoumenitsa on the Greek mainland with numerous ferry companies. The shortest crossings, as they cover the shortest distance, sail from Brindisi and Bari whilst travelling from the North of Italy will obviously take longer. Most of the crossings operate daily with frequency increasing around the busy period. You can also sail directly to the popular islands of Corfu, Zakynthos (Zante) and Sami on Kefalonia from Italy. One of the best methods and in many cases the only method for getting around the Greek islands is of course by ferry. There are numerous town and city ports offering connections out to the various island groups. The main hub for onward travel is the port of Piraeus (Athens) and from here you can reach upwards of 50 destinations with hundreds of crossings operating daily. In peak season Piraeus is one of the world’s busiest passenger ferry ports. Other key domestic departure ports include Thessaloniki in Central Macedonia which connects you with the Sporades and other North Aegean islands, Rafina and Lavrio in the region of Attica from where you can sail to most of the islands in the Cyclades group. Lesser used ports on the Greek mainland include Volos, Kavala, Ermioni and Kyllini. Greece’s largest island, Crete, at the foot of Greece doesn’t have any international ferry connections however there are numerous daily crossings from Piraeus sailing to Heraklion and Chania and from here you can connect with the Cyclades and Dodecanese Islands. There are more than 75 ferry destinations in Greece spread across hundreds of routes. Depending on the duration of your crossing, the ships used can range from luxurious cruise style ships on the longer crossings to small passenger jets on the island hopping services. For more information, please visit our Ferries from Cyclades Islands to Greece page. For more information, please visit our Ferries from Dodecanese Islands to Greece page. For more information, please visit our Ferries from Aegean Islands to Greece page. For more information, please visit our Ferries from Ikaria to Greece page. For more information, please visit our Ferries from Sporades Islands to Greece page. For more information, please visit our Ferries from Crete to Greece page. 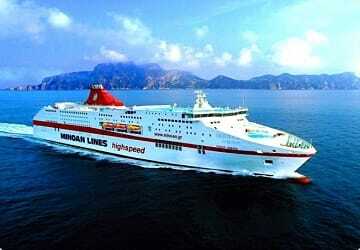 For more information, please visit our Ferries from Ionian Islands to Greece page. For more information, please visit our Ferries from Samos to Greece page. For more information, please visit our Ferries from Athens to Greece page. For more information, please visit our Ferries from Lesbos to Greece page. For more information, please visit our Ferries from Kefalonia to Greece page. For more information, please visit our Ferries from Zante to Greece page.